Your sales forecast is the backbone of your business plan. People measure a business and its growth by sales, and your sales forecast sets the standard for expenses, profits and growth. The sales forecast is almost always going to be the first set of numbers you'll track for plan vs. actual use. This is what you'll do even if you do no other numbers. When it comes to forecasting sales, don't fall for the trap that says forecasting takes training, mathematics or advanced degrees. Forecasting is mainly educated guessing. So don't expect to get it perfect; just make it reasonable. There's no business owner who isn't qualified to forecast sales -- you don't need a business degree or accountant's certification. What you need is common sense, research of the factors, and motivation to make an educated guess. 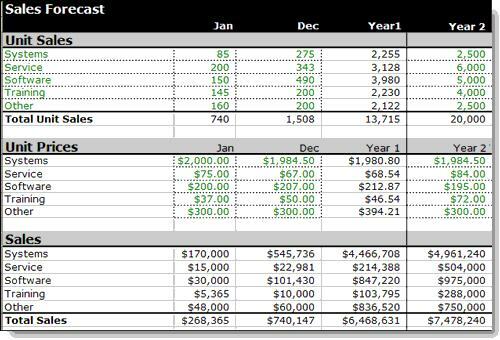 Your sales forecast in a business plan should show sales by month for the next 12 months -- at least -- and then by year for the following two to five years. Three years, total, is generally enough for most business plans. If you have more than one line of sales, show each line separately and add them up. If you have more than ten or so lines of sales, summarize them and consolidate. Remember, this is business planning, not accounting, so it has to be reasonable, but it doesn't need too much detail. Here's an example, from a sales forecast for a local computer retail store. It's a simple example. You should recognize the arrangement of rows and columns. I'm just showing you a portion of the spreadsheet, because it has to fit on the page. Notice the predictable structure. First you have units, then prices, then you multiply price times units to get sales. It's simple math, but breaking it up like that makes things easier later on, when you look at what went wrong (and remember, something will go wrong; business plans are always wrong). Even if you've never done a spreadsheet, you can do this one. The hard part is remembering that you can estimate, you are qualified, and nobody else can do it better. Just take a deep breath, calm down, and make an estimate. Or, if you prefer, read on. Let's talk about working from past data, estimating entirely new products, your data analysis qualifications, and some other factors. Then you can make your forecast. So What’s Accrual Accounting and Why Does it Matter? So you make a sale. When you deliver the goods, you record it as a sale. If the customer didn't pay you immediately, you record the accrued amount as Accounts Receivable. You order some goods. When you receive them, you don't pay for them. Instead, you record the accrued amount as Accounts Payable. At the end of the tax year you have some expenses outstanding, like professional services you know you'll be billed for but you haven't been billed yet. You accrue those expenses into the current tax year. They are deductible against income. In so-called cash basis accounting, the opposite of accrual accounting, you don't put the sale or the purchase onto your books until the money changes hands. With business-to-business sales, the norm is the money changes hands later. So accrual accounting is better. It gives your books a more accurate picture of your financial flow and financial position. Why does this matter here? Because timing of sales, costs, and expenses makes a difference. Start your forecasts correctly so the can be part of a more formal financial forecast when you finally need one. Just a quick note. I hope it's obvious. With examples in this book I'm not showing you the full columns of the spreadsheets, because that would be awkward. Numbers would have to be very small and difficult to read. 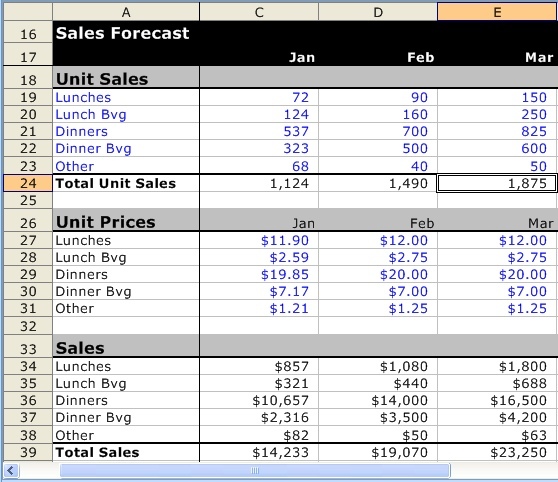 I use my spreadsheets for sales forecasting and other normal monthly projections with a standard layout. I base my tables on the standard spreadsheet layout as used in Microsoft Excel, Lotus 1-2-3, AppleWorks, Quattro Pro, and even the true pioneer, VisiCalc, the first spreadsheet, from 30 years ago. The rows are labeled from 1 to whatever, and the columns are labeled from A to whatever. When you get past the 26 letters of the alphabet you start over again, with AA, AB, AC, etc. 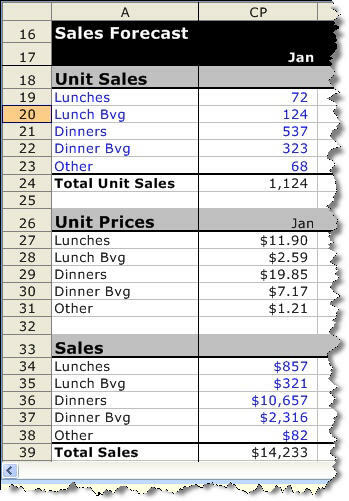 Labels in Column A Special uses for Column B 12 Months Monthly in Columns C-N Annual Columns as Needed. I run the labels along the lefthand side. These might be Sales, Expenses, Profits, etc. I keep column B open for variables like growth rates and such. This is convenient for starting balances too. My months go off toward the right, one by one, in 12 columns. The first year's totals of the numbers from the previous 12 months. Then come the additional years as needed. Don't reinvent wheels. Please. As you do your sales forecast, be aware that accountants and financial analysts have definite meanings for timing of sales. If you don't deal with this their way, then when you do eventually incorporate the work you've already done on the sales forecast into more formal financial projections, you'll have it wrong. It will look bad. So What's Accrual Accounting and Why Does it Matter? So you make a sale. When you deliver the goods, you record it as a sale. If the customer didn't pay you immediately, you record the accrued amount as accounts receivable.Then you order some goods. When you receive them, you don't pay for them. Instead, you record the accrued amount as accounts payable. At the end of the tax year you have some expenses outstanding, like professional services you know you'll be billed for in the future. You accrue those expenses into the current tax year. They are deductible against income. In so-called cash basis accounting, the opposite of accrual accounting, you don't put the sale or the purchase onto your books until the money changes hands. With business-to-business sales, the norm is that the money changes hands later. So accrual accounting is better. It gives your books a more accurate picture of your financial flow and financial position. Why does this matter here? Because timing of sales, costs, and expenses makes a difference. Start your forecasts correctly so they can be part of a more formal financial forecast when you finally need one. Your sales are supposed to refer to when the ownership changes hands (for products) or when the service is performed (for services). It isn't a sale when it is ordered, or promised, or even when it's contracted. With proper accrual accounting, it is a sale even if it hasn't been paid for. With so-called cash-based accounting, by the way, it isn't a sale until it's paid for. Accrual is better because it gives you a more accurate picture, unless you're very small and do all your business, both buying and selling, with cash only. I know that seems simple, but it's surprising how many people decide to do something different. And the penalty of doing things differently is that then you don't match the standard, and the bankers, analysts, and investors can't tell what you meant. Costs of sales or direct costs or costs of goods sold are supposed to be timed to match the sale. For example, when you buy a book from a bookstore, whatever that book cost the store to purchase was an amount added to inventory until you purchased it, and only then, with the purchase, it became an amount added to cost of goods sold. Notice the timing. It sits in inventory for as long as it takes, but it doesn't get out of inventory and turn into cost of sales until it gets sold. Messing that up can mess up your financial projections. When sales for the month are $25,000 and cost of goods sold are $10,000, you want the $10,000 to be the costs it took to buy whatever was sold for $25,000. If this month's costs are for things sold last month, or things sold next month, you get bad information. It's harder to keep track of this sometimes with services. The cost of sales for a taxi ride should be the gas, the maintenance, and the driver's compensation. But accountants would go crazy trying to match the exact gasoline costs to the exact trip, so they estimate a lot. They are always trying to match the months though; costs should be recorded in the same months as the corresponding sales. Expenses are supposed to show up in the month that they happen. Ideally, travel expenses are attributed to the month you travel, even if you paid the airfare two months earlier. Ideally, advertising expenses are recorded for the month that the ad appears in print, rather than the month when you submitted the ad. And they certainly should not appear in the month in which you pay for the ad, which often is two or three months later. You want the timing to match. "But I have a new product, how can I forecast for that. There's no history." Join the club. Lots of people start new businesses, or new groups or divisions or products or territories within existing businesses, and can't turn to existing data to use for forecasting the future. You're still going to forecast, and don't worry so much about it, because although you'll do it for the next 12 months, you're only going to be grossly inaccurate for the first month. By the second month, you'll have data to use to revise your forecast. Think of journalists covering a free election. They don't want to wait for the formal official results to be published, so they ask people coming out of polling places how they voted. Maybe those people tell the truth, and maybe not, but there's information to be gathered. They call this exit polls. And if the exit polls surprise people -- they thought Jones was going to win by a landslide but the exit polls indicate Smith is winning -- then the reporters investigate further. Are these early results coming from just one kind of voter (rich, poor, rural, urban, early voter, whatever) and does that one kind of voter favor Smith more than the rest of the voters? Time to apply common sense. You do the same thing with your forecast that journalists do with elections. You can get what data is available and apply common sense to it, human judgment, and then make your educated guesses. As more information becomes available -- like the first month's sales, for example, then you add that into the mix, and revise or not, depending on how well it matches your expectations. It's not a one-time forecast that you have to live with as the months go by. It's all part of the plan-as-you-go process. One of the more powerful drags on business planning in general is what I call fear of forecasting. Lots of people have it. "How could I possibly know?" is one of the more popular complaints. After all, who can predict the future? How can you know what's going to happen in the market, with the competition, or with new technologies. Isn't it just wasting your time to try to guess? No, it isn't just wasting your time, because one thing harder to do than forecasting is running a company without a forecast. The real question isn't, How can I possibly know what's going to happen? but, rather, How can I possibly know whether what actually does happen is good or bad or better than expected if I don't know what I thought would happen? Confusing? Think of it this way: although you forecast for at least a year, you actually go out on a limb only for the next month. In a month, you're going to review that forecast. You're going to see what is different from the forecast, and revise the forecast. Your year doesn't stay static after the first month if results of the first month cast doubt on the whole year. So don't worry so much; get started with your forecast, and you'll be revising. Remember, there is no single way to forecast any business. It's often very creative. Magda was looking at forecasting sales for a small restaurant. She hadn't locked in the location at that point, but she had a pretty good idea of the small size she wanted. She decided she would be able to seat six tables of four people each as a starting point. She knew that things might change when she actually decided on the space to rent, but she had to start somewhere, so six tables of four it was. 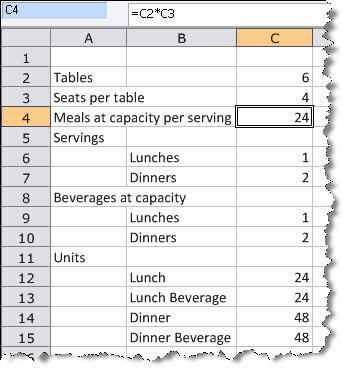 Then she did some simple math: six tables of four meant at capacity she would be serving 24 meals. Meals take about an hour at lunch, and about two hours at dinner. She figured she'd have one serving of lunch and two of dinner, roughly calculating the 5 to 5:30 crowd as the first serving, and the 7:30 to 8:00 crowd as the second serving. So an absolutely full lunch service in a day would be 24 lunches. An absolutely full dinner service in a day would be 48 dinners. She decided that an average lunch would be $10 of food and $2 of beverages. And that an average dinner would be $20 of food and $4 of beverages. Now let's stop for a second to consider this. Magda isn't turning to some magic information source to find out what her sales will be. She isn't using quadratic equations and she doesn't need an advanced degree in calculus. She does need to have some sense of what to realistically expect. Ideally she's worked in a restaurant or knows somebody who has, so she has some reasonable information to draw on. 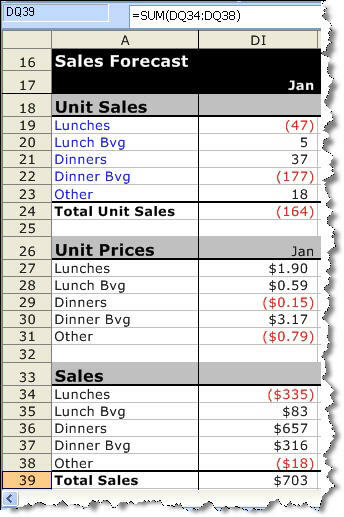 Lunches are 24 x 10 + 24 x 2, which equals $288. Dinners are 48 x 20 + 48 x 4, which equals $1,152. Having figured out what sales might be in a maximum day, Magda looks at how sales might vary for the days of the week. The provides a weekly base line. It isn't just four weeks per month; multiply an average week times 52, then divide that product by 12 to get an average month. In the example, you can see how Magda estimated conservatively, with fewer dinners on Monday, and closing at lunch on Saturday and Sunday. She knows she's not going to get a full capacity day that often. So she's calculated a baseline month, with around 370 lunches and 1,044 dinners. But she's also just starting up, so she comes up with an educated guess for a lot lower than that, around half the capacity. These numbers are not magic. The point of this example is simply that Magda has to find a way to make sense of her forecast. As you work with yours, don't look for some answer out there in the world, like a right answer to a puzzle; look for ways to break your assumptions down into the logic you need to work with them. 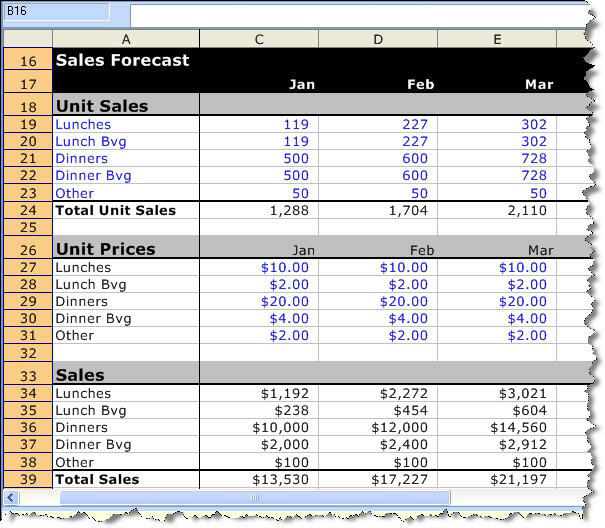 If you don't know how to work a spreadsheet, using formulas for rows and columns, read Spreadsheet Basics. Don't fear the math, or the financing. By the way, you can represent your forecast graphically, with the right tools. You might draw the line to help yourself visualize the way the numbers flow. Here's an example of how a simple line graph can forecast Magda's lunch sales for the first year. Remember, please, these are not scientific numbers. They are based on assumptions. Magdo will review these numbers every month and tune them against reality. So therefore she doesn't have to guess right for long stretches into the future; she just has to start with a reasonable guess and then start tracking. Furthermore, you don't have to be right from the beginning because as your business goes on, you constantly improve your forecast. After the first month, as you look at the second month and all the rest of the forecast, you have the results from the first month to work with. Always review, and revise as the review indicates. This next illustration shows the difference between what was planned and what happened. Using these numbers, Magda revises her sales forecast for the rest of the year. Why wait? She had a logical first guess based on some simple numbers, but now she already has real-world results. See the next illustration. And now her sales forecast is up and running. Plan as you go. Although we probably agree that the best way to forecast sales is by looking at past experience, I know that you can't always count on having that kind of information available to you. So let's think about some other examples. It's never as exact as it sounds. There's a lot of creative guessing. Following are a few ways you might forecast sales of a new business. The point isn't to list the only acceptable methods, but rather to suggest that anything logical might work. You want to sell products over your website? OK, find a way to predict traffic. Maybe you can buy search terms. For example, with Google advertising, Google AdWords can help you estimate how many will see the link you buy on the search terms. Then you estimate how many of those people actually click your link. Estimate a very low percentage, less than 1 percent, unless you have the world's most compelling link. Then estimate how many of those actually buy what you're selling. That's a low percentage too. At least with this you've got some mathematical basis for unit sales. And if you're estimating more than one per thousand, be careful -- it's probably too high. Doing retail business? Find some estimates of sales per square foot for your type of business. You can do a Web search for that, and you might find something useful. I found annual sales per square foot for Best Buy, Apple, Neiman Marcus, and Tiffany, and learned that Apple does $4,000 per square foot, compared to $2,600 for Tiffany and less than $1,000 for the other two. Let's say you've self-published a book you wrote and paid to have the book printed. Forecast your sales through different channels: Amazon.com and competing websites first, then perhaps through distributors to physical bookstores. But can you get that book into distribution? Will bookstores accept you? Use the reverse tree method and call other authors from the same print to see how they did. Do a Web search on self publishing. Start a blog and use search-term advertising to generate readers. Estimate how many people who visit your blog will click a link on it to buy your book. Build your sales forecast according to the places where people can buy the book: online at your site, online at other sites, and physically in stores. Be realistic about how long it takes to get into stores. You are opening up a bicycle store in a summer tourist destination. Find an estimate of tourists, then estimate what percent end up renting a bike, then how many units that means, and go from there. Or count bike rentals per day, and build up a forecast from there. Selling products through channels of distribution? Maybe estimate unit sales by channels. During professional consulting? Estimate by the job, the day, or by the hour. Make assumptions based on leads. Lots of companies use pipeline analysis: how many leads per marketing effort, how many presentations per lead, how many closes per presentation. Whatever your business is, find some numbers and logic for it. Break your assumptions down into units, and price per unit, and make sure there's some way you can check on the logic and revise and track as the numbers flow in. The key to this is watching the actual results.